It’s sad to hear about the death of Tony Iveson, a friend of this blog, and someone who was assiduous in campaigning for greater recognition of the role played by Bomber Command during the Second World War, particularly the campaign for a permanent memorial. Although he was at RAF Scampton for the Dambusters 70th anniversary commemorations, he was taken ill shortly afterwards. In fact his first wartime operations were in Fighter Command during the Battle of Britain. He later retrained as a bomber pilot and joined 617 Squadron a few months after the Dams Raid. He served with the squadron for over a year and took part in three attacks on the Tirpitz, including the final one in November 1944, where the battleship was sunk after three direct hits from the Barnes Wallis-designed Tallboy bombs, dropped by crews from both 617 and 9 Squadron. In January 1945 he flew a crippled Lancaster back to Shetland from Bergen, even though four members of his crew had baled out, convinced that he would crash. 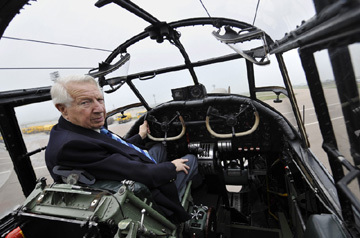 Just over five years ago, Tony Iveson flew again in the BBMF Lancaster, and took the controls for a while. (I blogged about it at the time, reproducing the fine article which appeared in the Daily Telegraph.) He also appeared on the BBC’s Desert Island Discs (another connection to the Dambusters with its signature tune by Eric Coates) and you can listen again to this here. Obituary in the Daily Telegraph. I had the privelege of meeting Tony on several occasions, both at the Bomber Command Christmas lunches at Sonning and last at the Bomber Command Memorial unveiling last year. It is with great sadness to learn of his death last week and my sympathies are extended to his family & friends. My own father would have been 103 on 5th November. He was one of the unlucky ones and lost his life on the Essen raid on 6th June 1942. R.I.P.